Water is one of the most important health benefits for all earthly animals. Just like in humans, water is required in sufficient amounts to provide the many health benefits for your cat also. It helps prevent constipation and regular urination bladder infections. 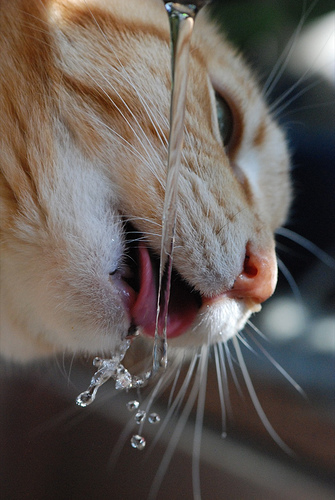 Many cats may not drink as much water as they should. This is one reason the urine becomes so concentrated and predisposes some cats to urinary tract disease. Cats with urinary tract or kidney disease have a critical need for water to support kidney function or prevent crystal formation and obstruction. Popular pet water fountains come in a variety of sizes and shapes for the different needs of individual pet households. Water from a reservoir passes through a charcoal filter to remove impurities and provide cats with a constant supply of fresh-tasting water. The drinkwell pet fountian filters and aerates continuously moving water to keep it much fresher than standing bowl water. It satisfies the urge for running water and so helps eliminate jumping on counters in search of dripping faucets. A soft and supple coat, bright eyes and sweet-smelling breath are the signs of a cat with sufficient fluids in its system by using a cat drinking fountain. It’s a cat that will live a long and healthy life, free of urinary tract or kidney diseases.